We just finished up our last real week of summer, and we wanted to send it out with a bang. What better way to do it than with an end of summer playdate with some of our friends? We planned a kids’ luau for our end of summer party, and it went off without a hitch (or britches, in Izzie’s case, but that’s another story). And even better- it didn’t cost an arm and a leg! My daughter is OBSESSED with kids’ party planning. She makes lists, drawings, and diagrams in preparation. She plans menus. She shops for goodie bags. She visualizes the décor. The only problem is? Then she wants me to carry out her vision. Which is no mean feat, as it turns out, especially when you are as big a cheapskate as I am. So when she decided “she” was going to throw an end of summer party, I used my powers of persuasion to convince her to throw a kids’ Luau instead. This decision might have had something to do with the fact that I have a garage full of island décor from my sister’s baby shower, but she didn’t need to know that. 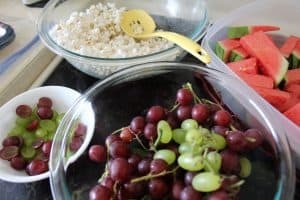 By reusing decorations, buying in-season fruit for the snacks, and keeping it simple, we found a way to throw an amazing end of summer playdate for my daughter and her friends. And there were cocktails. Because of COURSE there were. Read on for the recipe for a perfect end of summer luau (and those cocktails. Because YUM). This post contains affiliate links. You can read more about it at our legal page. Thanks for supporting The Salty Mamas! So you may not be as lucky as I was, and you may not have some giant inflatable palm trees sitting around in your garage. But you know what? You don’t need to. 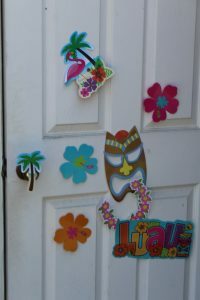 The Dollar Tree recently had TONS of luau decorations for-you guessed it!- $1. It doesn’t take much really. Just a few decorations to tape up, a table cloth, and a banner, and you’re set. If you’d rather go the easy route, Amazon has super cute luau themed party décor. These are the ones we actually used (both at my sister’s shower and Lila’s Luau). Buy some leis to give as party favors, if you’re into that sort of thing. A couple clicks, and you’ll be done. 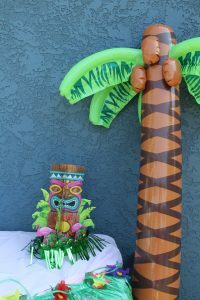 Don’t have any Luau Décor, and don’t want to throw away money to buy some? You’re in luck- we’ve got some printable décor- including sweet little Hawaiian flowers and a printable banner!- just for our subscribers. 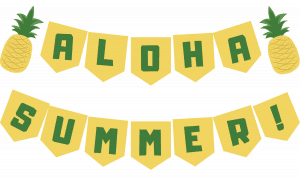 Get Your Printable Luau Banner! 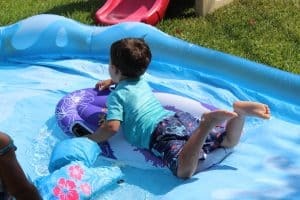 My mom gave my son the world’s most epic inflatable water slide for his birthday, so we decided to bring it out for the party. It’s expensive, but such high quality that I feel it’s 100% worth it. 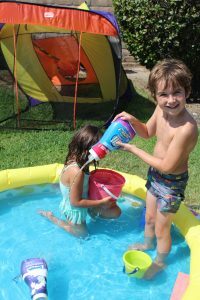 You could also try this DIY splash pad idea, or get a small splash pad for a great price instead. 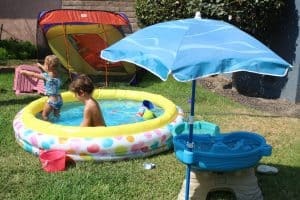 We’ve been using this cheap inflatable pool all summer, and it’s holding up remarkably well. We added in some recycled pouring tools- some detergent bottles, an apple juice container, and a few bowls- and gave it a whole new life for the party. We also set up a water table for the littles, and threw some sand toys in it. The littler ones had a ton of fun using the shovels to fill up the pails, and scooping up water with the sand molds. A cheap pack of sidewalk chalk rounded out the summer activities, and gave the kids a way to relax in the shade. As an added bonus, wet chalk behaves differently than dry does, so it was a unique twist on a classic. I picked it up for free from Kmart (because of course I did), but you can snag some at the dollar store or Target on the cheap. I decided to keep it (crazy) simple on the food. I mean, it’s a two hour playdate. No one should come expecting a full meal. We had originally wanted to do tropical fruits, but it seems we missed the pineapple-in-season window. So we went with a mini watermelon ($1.25), a bag of green grapes ($1.50) and a bag of red grapes ($1.50). Because that’s what was on sale, and Mama doesn’t do more than $1/pound for fruit. We popped some popcorn kernals in our air popper (do you have one of these? They make the BEST POPCORN EVER.) Popcorn is actually a very economical party snack, at a whopping cost of about 50 cents for 8 kids. It’s also relatively healthy and a total crowd pleaser (as long as your kids are out of the choking-hazard zone, that is). And then you know what we did? We called it a day. Sure, I could have made fruit kebabs or ocean-themed-jello-bowls cups, or a number of other things I found on Pinterest. But in weighing the effort versus benefits, I just didn’t want to. And the kids could not have cared less. Ahhh, the true star of our luau. This recipe for Raspberry Vodka Lemonade is on POINT. It’s the perfect refreshing summer cocktail, and you can adjust the amount of liquor from strong to practically (or actually) non-existent, depending on your tastes. And when it’s hot, and you’re asking adults to sit around watching kids have fun in the hot, hot heat, they’re going to be a lot happier with a cocktail in hand. 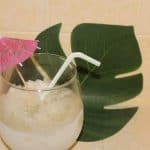 It could not be easier to measure, pour, and mix up a delicious batch of these alcoholic frozen lemonades for your next party. Empty the contents of the frozen lemonade concentrate into a large pitcher. Keep the canister- you're going to use it to measure the rest of your ingredients. Fill the 12 oz. canister with Raspberry Vodka, and pour into your pitcher. Feel free to use more or less to taste. Now fill up the can with 12 oz of cold water, and add that in. Add 12 oz, or one can, of Sprite. Mix all ingredients together. Pour into glasses, and return to the freezer for approximately 2 hours, or until slushy. Garnish with lemon slices, or add a sugar rim if you're feeling fancy. Enjoy! 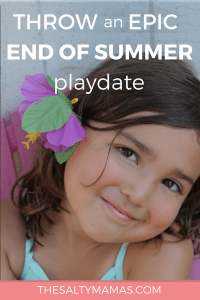 So if you’re looking to send summer out in style, consider hosting a low-stress end of summer playdate. You don’t have to go full Pinterest to create a fun-filled day for your kids and their friends. 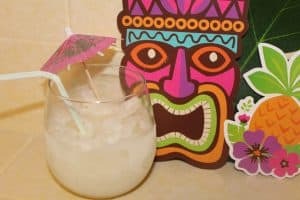 With a few decorations, some fun activities and (let’s be honest), some delicious drinks, your guests will be talking about your kids’ luau all the way into fall.